Our hearts go out to all those impacted by Hurricane Michael. The images coming out of Florida are devastating – many people have lost their homes and livelihoods. Right now, several disaster response organizations are on site deploying much-needed relief supplies such as food, water, shelter, and clothing. While organizations are working tirelessly on the immediate response, the long-term recovery and rebuilding efforts are just beginning. Survivors are going to need help and HOPE for a very long time. We are ready to help with the long-term emotional recovery by sending messages of hope and healing to survivors and impacted communities. Help us send HOPE to survivors. By painting Stars of HOPE, you can let survivors know that they are not alone and that people from across the country are thinking about them – it’s sometimes the little things that mean the most. Paint Stars of HOPE: You can help from home or work by painting stars with messages of hope and healing and sending them to survivors. Order a Box of HOPE to get started. Donate to Stars of HOPE: After a natural disaster, our team deploys to bring Stars of Hope to devasted areas through community and school paint projects. Donate Now. Where do I send my Stars of HOPE after I have painted them? We have ordered two boxes of “Stars” for this cause and will send it to you when we are done. We are organizing a “painting day” to get this accomplished. The last box of stars we did for Marjorie Stoneman Douglas HS, and when I saw the email about this I asked staff and not only did they want to participate but wanted me to double our last order! Thank you for your support! 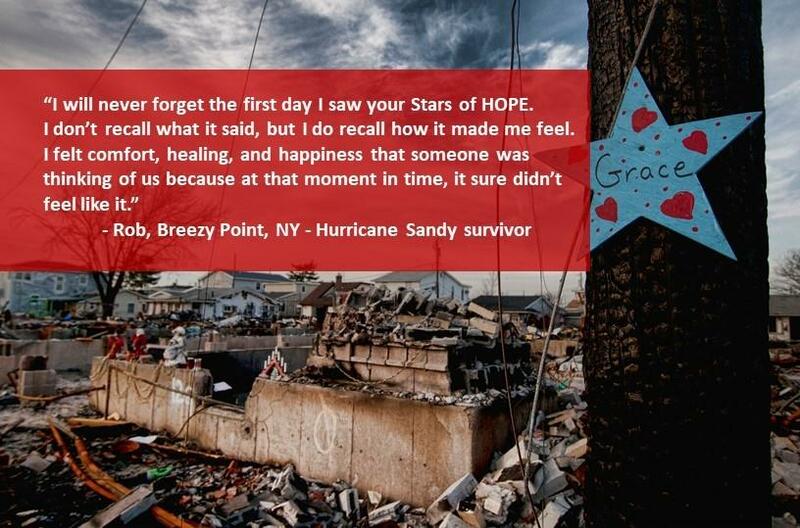 We know the stars you all create will bring hope and healing to those impacted by Hurricane Michael. We have shipped our stars to Josh Garcia at the address listed on this page. Please ask him to contact us when he receives them and send us pics when they are posted in the area. This serves as a inspirational tool to our staff to participate again in the future! Good morning. I came across this organization and am moved by it.My husband and I have visited and vacationed and loved the area impacted by hurricane Michael so it is personal to us. We will be passing through the area in late February possibly staying in the area a few days.Is there an area we can see the stars displayed? We are in touch with Habitat for humanity and are volunteering to help them but not sure what we will be doing. If there’s a need for people to hang up the stars maybe we can help.What do you think? As the mother of an Marjorie Stoneman Douglas graduate…thank you to the Tampa Group for remembering the community and the students and showing them love … The Stars were hung on the fence surrounding the school for all to see. As I have moved away from the area I did not personally see them but was told by friends that they were so really “Cool” and so appreciated.